I was a happy bunny on arriving home after a long day at work, including a meeting at the end of the teaching day. 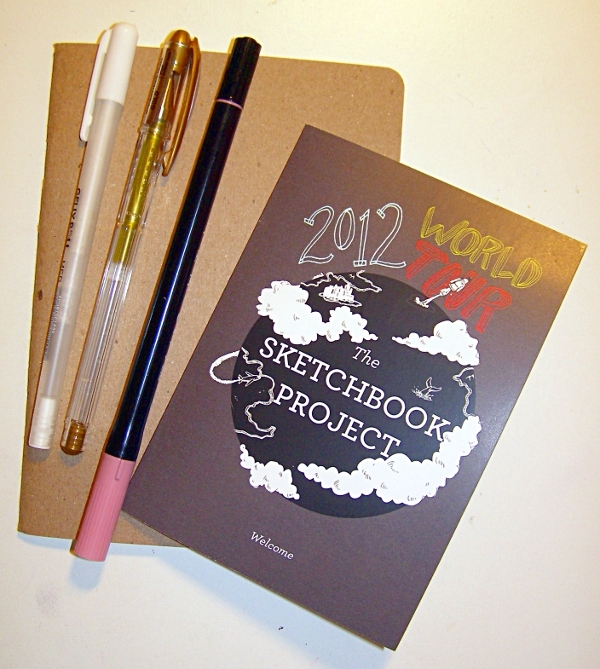 I found two of my hypnotherapy books had arrived, and also my sketchbook for The Sketchbook Project 2012! My chosen theme is ‘Prehistoric’ (no surprises there, eh?). I have one piece of art to finish off, and then I will make a start on this project … it should be fun! Yesterday I attended the opening night of the Aber Valley Arts Festival. I had entered three pieces of work into the competition, including ‘Moments after the big bang’. I won first prize in the textile section of the competition! 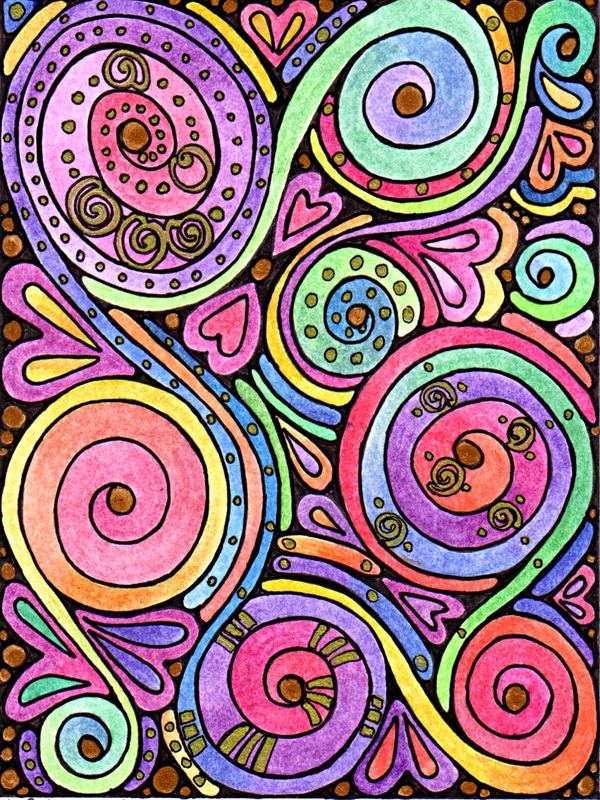 Dimensions – 23x30cm, approx. Silk fibre needle felt on a black felt background. Embellishement with beads, metallic and Japan threads, and custom-made sequins. Photographs never seem to do my work justice, simply because I’m not a photographer. There is no idea of the shimmery nature of the work, the way that the gold Japan threads used to outline various parts of the needle felt define the shapes and provide a channel along which the colours seem to flow like oil on water. There is no sense of the texture and heights/depths that the needle felt has brought to the work, nor to the patterns and textures the beads give. The colours still look garish in the photograph, yet in the actual piece they are more subtle and muted. I have spent many hours on this so far – around 30 I would guess. Every moment has been a pleasure, and I’ve even caught myself looking at it and smiling at how well it is working out – unusual for me as I’m my own worst critic, and it’s a step forward that I can appreciate the beauty in my creative work. It’s finally arrived. Today marks the end of my freedom to a degree. Tomorrow I return to work, to a structured day and all the ups and downs that go with the job that teaching is. My time for art and other pursuits will become very limited. I will miss the slow starts to the day, the spontaneity of trips and visits and time with friends. Friday afternoon I spent with a friend in a local cafe-bar, drinking, talking about art and other things, working on art, having nice food and laughing before going to take the weekly meditation class I lead. I will miss the opportunity to do those kinds of things. There’s definitely a coolness in the air in the mornings and evenings. It’s a feeling I associate with the coming of autumn, the return to school, the start of the new academic year and a sense of hope of better things to come, a hope that was usually misplaced, and still is. However, I still hope that a new school year and a new term will bring new attitudes, opportunities and good achievements. This year, the new attitudes must be towards myself and my expectations of me and how I react to the poor attitude/behaviour of others. The Summer break has allowed me to relax, to become who I am meant to be. I like this person, I like the contentment within me, I like the confidence that comes with it. What I don’t want is to lose this with the stresses and strains of teaching. There’s a challenge! One of the tasks left mostly undone over the Summer was too look for an alternative career/job, one that will allow me to use all my personal skills/talents/gifts in a positive manner. I’ve been stumped as to what to do, and looking around at available jobs there is nothing that seems to fit me, well not yet. So that’s another task for the coming weeks – to keep looking at available jobs, to seek advice, suggestions, to continue the audit of my personal skills to help me focus on what I could do. I have been thinking about training as a hypnotherapist. The biggest stumbling block for me is finding the money to pay the fees. I’m making enquiries about that…so finger’s crossed!